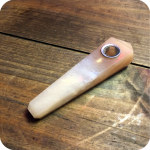 The Sunstone Crystal Pipe is a beautiful and powerful pipe. The Sunstone Crystal Pipe is just as much a practical smoking device as it is a healing stone. It works great for mediation and finding joyful energy. The sunstone’s energy comes from the sun god, Ra. It is considered by many to be a stone of leadership. It inspires individuality and independence. Many people find it to be a healing stone for getting past overly dependent relationships, or the loss of a loved one. These stones reflect the power of light by giving you strength, warmth, and benevolence. The pipe is only about four inches long, and has a nice weight to it. It is very strong stone, and very simple to use and clean. 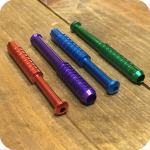 With enough care and maintenance this pipe could last you a lifetime. This pipe pairs quite nicely with some I-Tal Hempwick. The Sunstone with help your spirit, while the hempwick will help your psychical health by bypassing toxins from butane lighters. 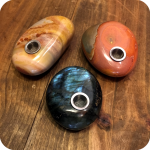 Just light the end of your hempwick with your lighter, then light the Sunstone Crystal Pipe with the end of the hempwick and enjoy a much better taste as well a healthier experience! 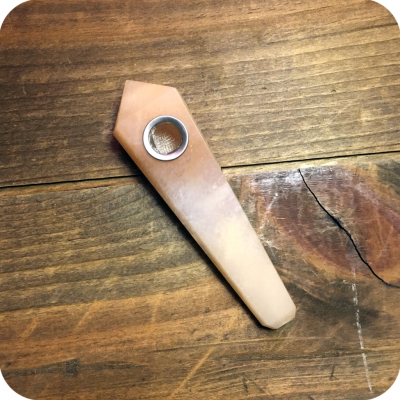 The Sunstone Crystal Pipe is a wonderful pipe for anyone looking to bring some positive sun vibes into their home and daily smoking rituals! Tags: crystal pipe, Meditation, Sun God, sunflower, sunflower glass, sunflower pipes, Sunstone, Sunstone Crystal Pipe.